Still on the cedar plank kick and the first white peaches were available at the A&G (some day I’ll get to a post on our local market). As I was perusing back issues of Cuisine I found this little recipe so thought I’d give it a try. Kori had given me a blueberry/onion chutney brie recipe at one time that I really enjoyed and upon re-visiting that recipe, years later, John spit out his first and only bite. I didn’t mind it so much. This time around I was hoping for better results – and I got them. There was one loaf of rustic bread in the freezer so I wrapped it in foil and threw it on the grill too. 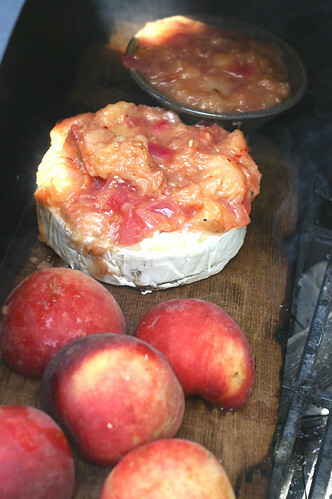 The cedar lent a nice smoky flavor to the peach halves and the brie, but not so much to the chutney. I will probably make this one again and forgo all the fancy plank process. 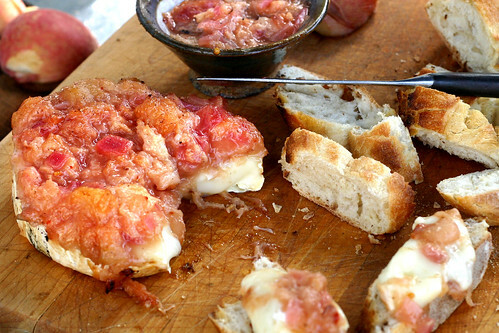 Be sure to slice off the top skin on the brie before piling the chutney on top. OR you can just serve the chutney on the side. Saute until tender and the wine has reduced nearly all the way and mash the peaches. Serve with warmed brie and French Bread. I like how rustic this recipe looks. I would probably be up there with John in spitting out the blueberry/onion chutney. It doesn’t even sound good. But peaches or apples….now that’s heaven. Ive done meats on a cedar planks but brie! YUM!!! Oh myyy.. does it taste better than it looks? because that means this would be OUT OF THIS WORLD GOOD!! !